Bob Hartman is the author of the best-selling Lion Storyteller series and a number of picture book retellings of favourite stories including: "The Wolf who Cried Boy" and "Dinner in the Lions' Den" and the highly acclaimed "Angels, Angels" all around. Sales of his books are in excess of one million copies. Bob divides his time between writing and storytelling in schools and libraries. 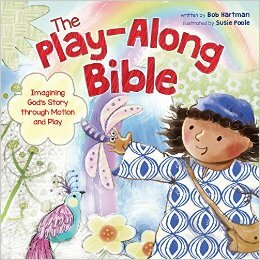 The Play-Along Bible by Bob Hartman is adorably cute! I love that the The Play-Along Bible gets kids involved while learning about stories and scriptures from the Bible! My kids absolutely loved this book. We read it in the afternoons and they love letting loose and using hand motions, facial expressions, verbal exclamations, and funny noises while reading this book. They have a blast and I'm completely amazed at how quickly they've been able to learn the stories. I absolutely love the multisensory approach this book takes and I know my kiddos do too! You can find The Play-Along Bible by Bob Hartman on Amazon, Barnes and Noble and other bookstores.